In many ways, this is very similar to Where the Mountain Meets the Moon. So, if you’ve read that one (and you should), you know what you’re in for. 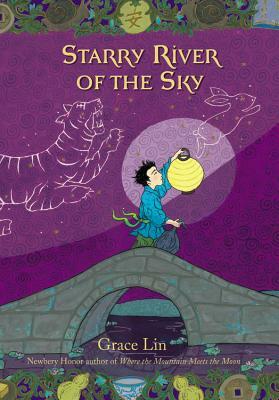 Alternating the main story with Chinese folk tales, with Lin’s luscious illustrations, she tells just as a compelling and charming a story as the first time around. Thankfully, you don’t have to have read Mountain in order to enjoy this one: the story is in no way (at least from my recollection) connected to the other book. It’s the story of Rendi, a runaway boy who happens to find work at a local village inn. The moon is missing from the sky, and Rendi is the only one who seems to hear the screams at night, so he knows he has to find it and figure out how to put it back. However, he’s reluctant to do so: he’s grumpy and complaining all the time, and would just rather run away than do the work. The inn starts to work its magic: he makes friends with the innkeeper’s daughter, Peiyi, whose older brother has gone missing. And a mysterious lady, Madame Chang, appears teasing Rendi’s story out of him. I had much the same reaction to this one as I did to the first: it’s nice. Really, really nice. Elegant nice. But, I think I enjoyed it more than I remember enjoying Mountain: I enjoyed Rendi’s story, I enjoyed how the folktales wove in and out of the main story, but also served to enrich the main story as well. And even though I guessed the ending before it was revealed, I was still surprised by the way that Lin wrapped everything up. And maybe just for that surprise, I find myself mulling over this one, and am more than happy to own a copy. It’s definitely one I’ll be recommending to others.